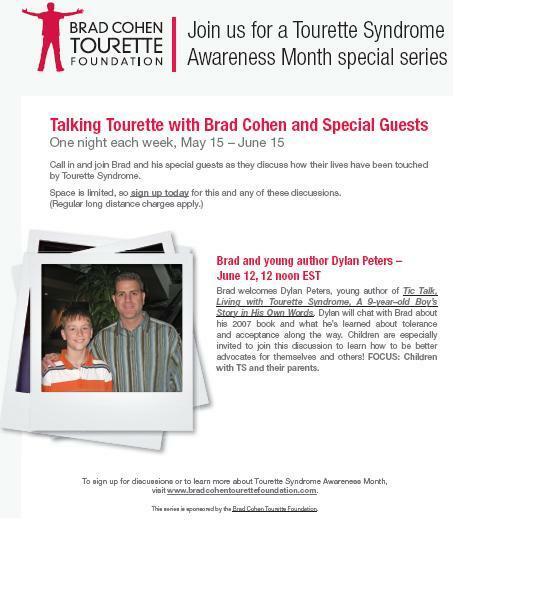 The call with Brad Cohen and kid author Dylan Peters will be on Saturday, June 12th at noon/EST and will last 1 hour. 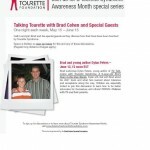 Learn how children can become advocates for themselves and how one boy decided to not only tell his classmates, but tell the world about TS through his book, Tic Talk: Living with Touretre Syndrome, A 9-year-old boy’s story in his own words. Feel free to email us questions to read during the call. The conference call is free to the public. Feel free to share this information with anyone who may be interested. Education about Tourette Syndrome will continue to make a difference for those who live with the condition daily. 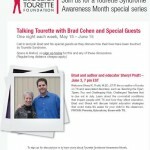 This event is sponsored by The Brad Cohen Tourette Foundation. Thanks for the support of Tourette Syndrome Awareness Month! The call with Brad Cohen and educational consultant/author Sheryl Pruitt (Teaching the Tiger) on Thursday, June 3rd at 7pm/EST will last 1 hour. Learn about the co-morbid conditions that go along with Tourette syndrome as well as other education strategies for the classroom. Feel free to email us questions to read during the call. The conference call is free to the public. You are currently browsing the Class Performance blog archives for June, 2010.